In the era of late modernism, Scott Brownrigg & Turners scheme for Victoria Gate (formerly known as Ryde House) in Woking combined modernity and functional rationality, bringing energy measures to the outside and using them in a deliberate way to articulate the façades. Here Chairman, Jonathan Hill looks back at the reasoning behind this and the challenges involved in delivering the building back in 1987. During the 1960s and 1970s, the town of Woking underwent significant change, with investors such as Norwich Union (now Aviva) undertaking new retail and office developments. By the early 1980s some buildings of the previous generation were reaching the end of their useful life. The new perimeter road, Victoria Way, offered the opportunity for redevelopment as it gave Victoria Gate, originally constructed in the 1960s a strong presence to the new road. At the point of consent for Outline Planning it had been anticipated by those involved that a precast clad building, similar to the council offices would take its place. 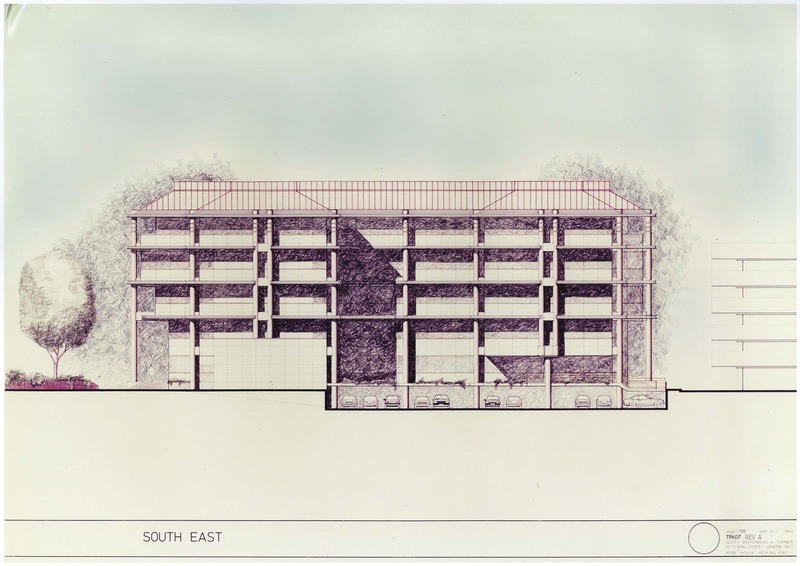 The detail design commenced in earnest in 1984 to clear reserved matters and the opportunity was taken to identify the drivers for the scheme with the client, which included; – a highly attractive building with a distinctive image appropriate to office users with hi-tech requirements, flexibility, well-serviced offices, large floor plates and a good standard of parking. The team was now driven by an inclination for modernist, functional rationality that would provide commercial advantages to the client. They wanted to avoid the use of the vogue style of postmodernism, where geometry and decorative patterns of materials and forms generated an architecture that often did not reflect the internal use or provide flexibility. They also acknowledged that the smooth clean lines of a simple and easy to construct form often fails to integrate appropriately in an urban context, and is unable to assist the building in working environmentally. The team therefore explored an alternative route, a sophisticated envelope with a measure of articulation to the façade, achieved through an external structure and brise soleil. The outer line of the envelope was fixed by the Outline Planning Consent and the parking ratio, so the challenge was to generate more net lettable area within the same external envelope. The precast concrete panel solution, although fast to construct, generated walls that were in the region of 300–350mm thick, thereby considerably reducing the net lettable area. To deliver the maximum benefit to the client the decision was therefore taken to move the internal perimeter columns. This enabled a clear and flexible office floor plate to be achieved. An additional 14.3 sq m (150 sq ft) of net space was gained. The clean straight line of the interior external wall was very different to most buildings of the period, and many today cannot boast such a flexible arrangement. The structural silicone adhesive fastens the glazing to the curtain wall transoms and mullions, and carries the full weight of the double glazed units which comprise a high performance (for the time) ‘reflectafloat’ external leaf. The silicone provides air and water protection, is a good thermal insulant and is also able to absorb stress from thermal and wind pressure movement. With this construction technique there is no need for capping strips or any mechanical fixing. This technique was only introduced commercially in 1978, Dow Corning recorded that the first structurally glazed curtain wall in New York was constructed in 1985 at the same time as Victoria Gate. These panels are 3.75m x 1.8m in size. The honeycomb construction is more efficient at providing a very flat and stiff panel than the solid aluminium sheet, traditionally used at the time. The overall thickness of the panel was about 20mm. The honeycomb composite panel technology has been used very successfully since the invention of suitable resin adhesives and has been used in Boeing 747 for floor panels (1979), and more recently in next generation electric cars including the BMW i3 and i8. Enabled the wall construction to achieve a ‘U’ value of 0.4W/m2/k, which was well in excess of the Building Regulation requirements at the time. A custom designed slim line perimeter heater was integrated into the wall and provides a PPC finished casing that is visible inside the office. The slim dimensions of the wall generated approximately 118 sq m (1,200 sq ft) of additional net area, which when coupled with the increase from the exterior columns accounted for a 2.6% increase of the net area of the building. The 1970s and 1980s were a time when insulation and energy measures were starting to be considered. Having placed the columns externally the team sought a design solution that would also help reduce the impact of solar gain, with benefits to the scale of the A/C plant and risers (reducing the size of the cores and providing more net lettable space) and also provide access to the façade for cleaning. A grillage with deep bars spanning parallel with the façade to block the sun was developed. This grillage was supported from custom designed extrusions of anodised, structural aluminium that span to cleats cast into the in situ external concrete columns. The extrusion has slots that allow hidden fixings, enabling the grillage floor to be clamped inconspicuously. During the late 1970s and early 1980s, the module for office design was in transition. Projects were subject to team and client discussion on whether to use a 1.2m or 1.5m planning grid. This debate was driven by the construction component industry, which had been very slow to adopt modules that co-ordinate with 1.5m due to economic reasons, whilst 600mm raised floors tiles and ceiling tiles/grids as well as 1200mm plasterboard are still readily available and economical. The more important reason however was the size of the modular offices that resulted from each grid. At this time most fit-outs incorporated a high degree of cellularisation, with room widths 2.4m and 3.0m wide with increased flexibility to accommodate two workers in a cellular room in the 3.0m wide planning module. For the project, the team elected for a 1.5m planning module and 1.5m long ceiling planks with linear light fittings. The 1.5m planning module was subsequently adopted by the British Council for Offices (BCO) within the first BCO Best Practice in the Specification for Offices Guide published in May 1994. It was noted however at the BCO conference in Madrid that Edesa had constructed their headquarters between 1999 and 2003 with an office module of 1.35m, which they considered to be even more economical and allowed for higher densities. 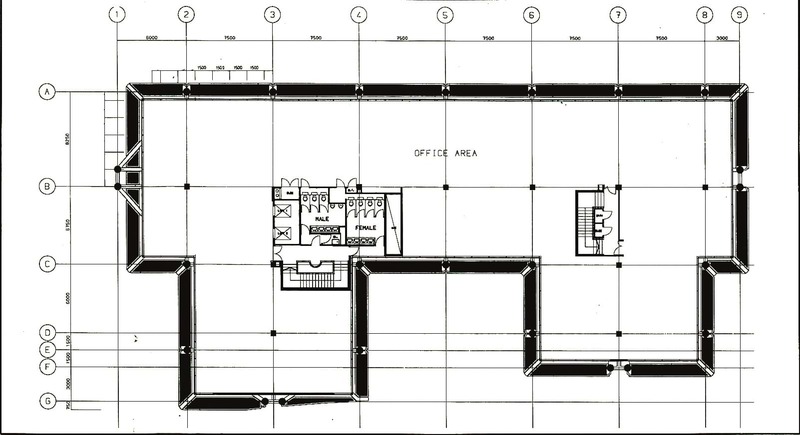 Having established the planning module, the office width was also an area of discussion during the early 1980s. Generally depths of 13.5m and 15m were used; at the time an 18m depth created spaces too far from windows and was therefore not popular. At Victoria Gate (which was intended to be an air-conditioned building) a 15m deep floor plate was adopted, enabling all occupiers to be reasonably close to windows, providing natural light and a visual connection to the outside. During the design phase the client stated that providing the office was let, the scheme would be a good investment, generating necessary returns within fifteen years. Thirty years on from its completion, Scott Brownrigg now has the opportunity to upgrade the building for Aviva, to take into account new regulations/legislation and take advantage of the changes to office design and planning policy. The robustness of the original design and opportunities for enhancement, outweigh the benefits that could be generated by a new build. The surrounding area is undergoing huge re-development, with the recently constructed WWF Headquarters and ‘The Lightbox’ located opposite the building. The building was designed to accommodate a load criteria of 4 + 1KN/m2. The BCO Guide now suggests 2.5 + 1 for upper floors and 3.5 + 1 for the ground floor. There is therefore some capacity to potentially add a new floor and extend the floor plates. Cross-laminated timber (CLT) is also likely to be explored to keep additional loads to a minimum and benefit from sequating carbon in the new construction. The site is very well connected to a transport hub, therefore parking standards have been significantly reduced by the Council, allowing more office space for the existing cars to be provided. Extending the floors to create floor plates that will be 18m deep is a practical option; this depth is now seen as standard for mechanically ventilated buildings. The innovative approach taken in the redevelopment back in the 1980s has worked well, providing a robust framework for refurbishment to generate a working environment that is highly attractive to future occupiers and one that continues to deliver increased value for the developer/fund for many years to come.